It’s common to struggle at times to find the right word during a conversation. But for an individual who has had a stroke, finding the right word may be much more difficult. 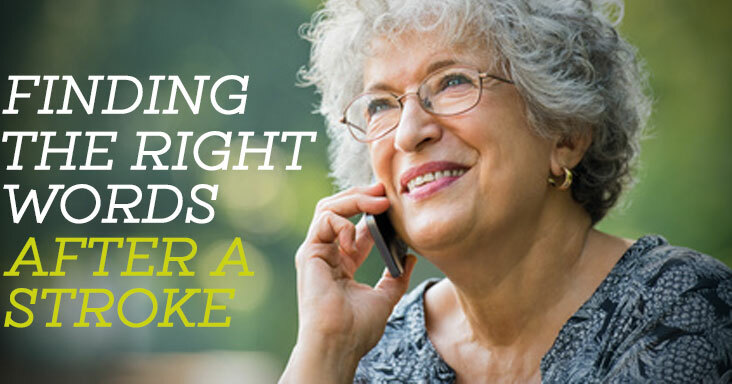 Aphasia can be a side effect of a stroke, which can affect a person’s ability to communicate by impairing the ability to speak, read, listen or write. When a person with aphasia has word-finding difficulty, it’s called anomia. Anomia makes it difficult to find the words or ideas that a person wants to share. Sometimes the word may come, and sometimes it won’t. When this happens in a conversation, the person who is speaking to the stroke survivor may want to jump in quickly to supply the word. But in reality, that can be more of a hindrance than a help. It would be more beneficial to help the person find the word they are looking for rather than supplying it. Allow plenty of time for a response. Talk with the individual, not for him or her. Ask “yes” or “no” questions that can be answered simply and without a lot of explanation. Use photographs or pictures to help provide cues. Write your cues – such as a letter or a drawing – on a piece of paper to share. Confirm and repeat back what the person has said. Use paraphrases or key words to be sure that you’re understanding properly. Use gestures as you ask questions.